IT'S official. The Knicks can't stand the Heat. Two days after their 100-67 spanking at the American Airlines Arena in Miami, the No. 7 seed New York Knicks faltered again Monday night, this time a 104-94 beating that gave No.2 ranked Miami a commanding 2-0 lead in their best-of-7 opening round series. The Knicks are two games away from elimination and there's no mystery to that. The Heat is playing at a higher level. They have far superior offense, a stifling defense designed to give Knicks' shooters fits, plus a deeper, more experienced bench. And with the Big 3 of LeBron James, Dwyane Wade and Chris Bosh at the helm, the wealth of Miami's talent is dazzling. The weight of all that might fell hard on the Knicks Monday as the Heat shot 38-of-73 field goals (52.1 percent) and 9-of-21 threes (42.9 percent). The Heat also bombarded New York with 50 points in the paint and they relentlessly attacked the basket, yielding 27 trips to the free throw line (19 made). The Knicks did well rebounding the ball, outworking the Heat 40-33 off the boards, but New York's offense sputtered with a high 13 turnovers and a low 15 assists. The Heat's offense, meanwhile, went smoothly with 28 assists against only eight turnovers. 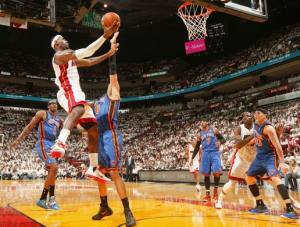 Dwyane Wade led Miami's onslaught with 25 points on 11-of-18 shooting, highlighted by fearless forays to the hoops. Chris Bosh was quietly effecient with 21 points while LeBron was a sight to behold with an all-around effort of 19 points, seven rebounds and nine assists. Mario Chalmers added 13 points and six assists for Miami while Mike Miller and Shane Battier finished with 11 points off the bench, combining for 6-of-10 from 3-point range. Carmelo Anthony had 30 points for the Knicks, who shot 38-of-77 from the field (49.4 percent), 5-of-15 from 3-point land and 13-of-19 free throws (68.4 percent). Game 3 of this series resumes Thursday night at the Madison Square Garden in New York, where the Knicks hope to reverse their fortune.